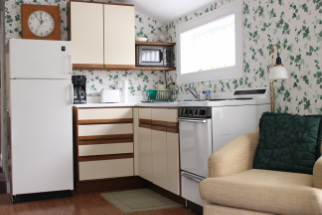 ​two cottages (large CRT)) and refrigerators. All reservations will be held for 10 days and are secured by sending a deposit of: 1 night for stays of 1-3 nights in length, 2 night deposit for stays of 3-6 days in length, or 33% for stays greater than 6 days. Balance of the stay is due upon check-in and must be paid with cash or check. special events, and/or high volume dates. high volume weekends require a 3 day minimum. appreciate a courtesy call to let us know. which minimizes losses due to the cancellation. There is internet available but the signal strength is iffy. We generally do get internet in the parlors of the main hotel but there is limited to no wifi to the surrounding buildings. We do not allow dogs on the property. ﻿﻿﻿ALL room cancellations are subject to a $50/room fee for reservations 1-3 days in length; $100/room for reservations 3-6 days in length . ﻿﻿﻿Stays of a week or longer have a non-refundable deposit equal to 33% of the entire stay. Cancellations with 30+ days advance notice of stay will receive a refund less the cancellation fee. Cancellations within 30 days of stay will receive a refund less the cancellation fee ONLY upon re-rental of the unit. Partial cancellations still follow the policy stated above. No shows will be charged the entire stay. 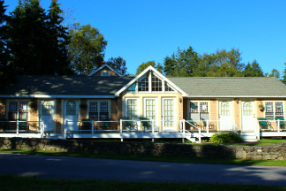 Workshop and Cottage reservations will lose the full deposit upon cancellation. Reservations are not transferable. Special reservations held for extended amounts of time will be negotiated on a case-by-case basis. PLEASE NOTE THAT THIS DIFFERS FROM OUR RESPONSE CARDS DUE TO A CHANGE IN POLICY AFTER THE CARDS WERE MADE! ALL high-volume weekends have NON-REFUNDABLE deposits and do not comply with or general refund policies. Weekend stays have 2-night minimums with a non-refundable deposit paid in-full. Special weekends have 3-night minimums with non-refundable deposits paid-in-full. late arrivals or early departures. ​value for the same price. Please call (781) 321-7150 to make a reservation. Inquiries and requests can also be made through our contact page while we are closed for the season. Please include a contact number where we can reach you to discuss options and possibilities for your stay. International visitors can discuss and make reservations through our contact page but be sure to include an email address. Our preferred method of payment is cash and check. Checks that are returned for non-payment will incur the bank overdraft fee of $30.00 and the deposit will not be considered to be made. It is our expectation that the customer will make good on the deposit plus fee(s). Please include dates of stay on memo line of the check to reduce confusion. If you are paying for another person's stay with us or you have a different last name, please include the name on the reservation. 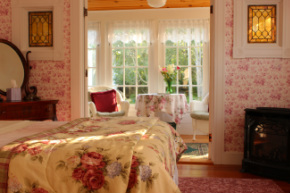 Gift certificates for future stays are available for purchase. 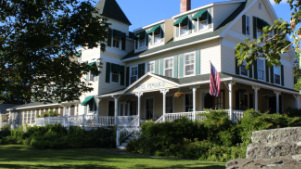 The Hotel Pemaquid has 31 unique rooms and two cottages, each offering a variety of comforts and amenities particular to the specific room. The rates below describe rooms of a similar type and price located in a specific building; the hotel is made up of 10 buildings in total. 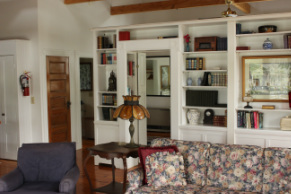 Many pictures of the buildings and rooms can be seen on the "rooms" page of this website. Prices shown below reflect payments made with cash or check. Total cost per room is the price shown plus state hospitality tax; currently 9%. Average sized cathedral ceiling-rooms with small private baths(shower only). 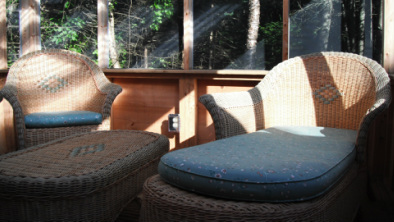 Comfortable rooms with separate sitting areas , full baths, and queen beds. beds: queen, two twins, and double. Book any two or take all three. There is a 2 night minimum when booking this room. 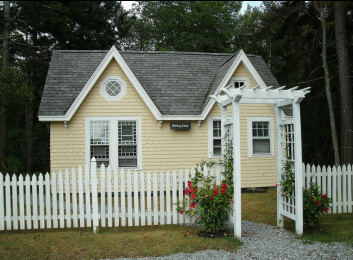 Spacious, open ceiling, turreted quarters with semi-enclosed queen bedroom, a full kitchen and bath, deck and balconies. Wonderful ocean views. You'll want to stay forever. * Please note that full payment of stay is sometimes required depending on type and date of reservation. ALL weekends must be paid in full, have non-refundable deposits, and do not follow our general refund policies. 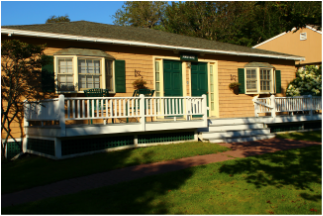 It is unlawful to have a camper, fifth-wheel, tent, or any other non-conforming accommodations at the hotel or near Pemaquid Point due to town ordinances. People staying at the hotel will be asked to remove such vehicles from the property by 5pm; no overnight parking for these types of vehicles is permitted.